The collect and readings for today, The Second Sunday of Advent, may be found here. The following sermon focuses on Isaiah 40:1-11. “Comfort, o comfort my people.” These are God’s ancient words to his people; spoken through the prophet Isaiah in the 6th century b.c. Their relevance and timeliness, however, are not lost on us today. It is not hard to find people in discomfort, lives in exile, and a world in turmoil. God’s words ring true in every age, place, and life because exile happens in every age, place, and life. Exile takes us to the wilderness. In the wilderness the mountains are high, the valleys are low, and the ground is rough and uneven. Many of us have climbed the mountains of arrogance, ego, and pride. Likewise we have descended into the valleys of despair, depression, and fear. We have travelled the rough and uneven ground of sorrow, loss, and pain. The wilderness is not so much about the geography around us as it about the landscape within us. That’s not just a description of our lives and our world. That is also a description of Israel in today’s Old Testament reading. Foreign armies have defeated the Israelites, taken them prisoner, and carried them off to a foreign land. Their home land has been overtaken by others and their temple has been destroyed. God, however, did not do this to them. They did it to themselves. Their own choices, ways of life, and sinfulness have brought this about. Every one of us could tell a story about a time when we were in exile, alienated from life, our self, those we love, and our God. Some of us may be in exile now. Exiles live in a foreign land: a land of guilt and regret, fear, sorrow, despair. That is never where God intended us to live. It is not our true home but sometimes that is where we are. Thoughts, words, deeds, things done and left undone are the roads by which we came to this land of exile. Sometimes we intentionally choose those roads for ourselves. Other times it seems as if we have no choice. We do the best we can at the time but we are ignorant of a better way, a different way; God’s way. There are many paths into exile but only one way out, the way of the Lord. 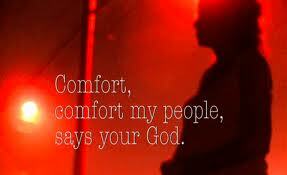 Like ancient Israel we long to hear words of comfort. We want to know that one more powerful than us is coming. Not the one who overpowers us but the one who is able to do for us what we cannot do for ourselves. We want someone to love us, forgive us, heal us, and take us home. Imagine the darkest place of your life; the fear, the anger, the hurt. Wondering when, or whether, it will end. You carry guilt and regret like a worn out suitcase wherever you go. The days are filled with “should’ve” and the nights with “if only.” Over and over the past is replayed to the point that you can see no future. Exile, alienation, wilderness. God sends Isaiah to carry his words of comfort to Israel and to us. “Speak tenderly to Jerusalem,” he instructs Isaiah. God knows that life in the wilderness is fragile. This is not a time for condemnation, judgment, or ridicule. Sometimes exiles are holding on by a thread. They need words of comfort, encouragement, and hope. Isaiah is to speak softly to their heart. He is to call them home. That is after all what repentance is about. It is about coming home. When John the baptizer appeared in the wilderness proclaiming a baptism of repentance he was echoing Isaiah’s words. “It is time to come home.” Repentance prepares the way of the Lord. It prepares the way home. God’s promise is that the mountains will be made low, the valleys will be lifted up, and the rough and uneven ground will become a level plain. The way will be prepared. This is not so that we might get out but so that God in Christ might get in. God is always coming to us. There is no situation in which God cannot come to you. Isaiah (sounding a lot like Diana Ross) reminds us that there is no mountain high enough, no valley low enough, no ground rough enough to keep God from coming to you. 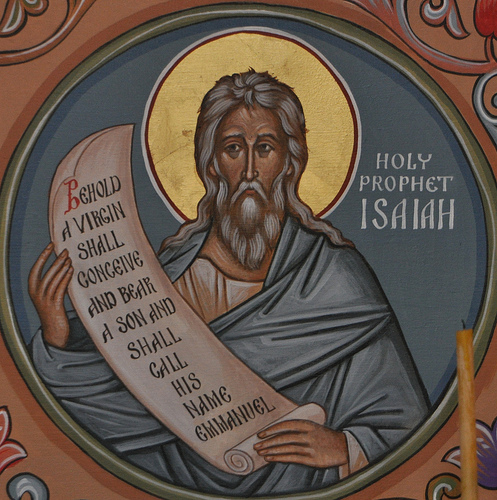 “Here is your God,” Isaiah exclaims to Israel. In the foreign land of exile “here is your God.” God comes to us in the worst places imaginable. He gathers us in his arms and carries us in his bosom. God’s words of comfort come to us in our exile. Our wilderness is the geography of new beginnings, reconciled relationships, and salvation. It all starts with repentance. Repentance is not so much about the guilt of our past but a present hope that reveals a new future. Love and new life cannot be sustained by the same old ways, the ways that took us into exile. There must be a conversion, a change of heart. If new life and love are to last we must call into question our usual ways of being and doing. We must be willing to grow and change. We need to orient our life in a different direction and live at a new level of consciousness. We must face the truth of our life; not as the final judgment of our life but as the foundation for our hope, expectation, and longing for the one who is more powerful.